This photo shows a rug that has gone through immersion rug cleaning at Chem-Dry of Tampa FL. Immersion rug cleaning involves submerging the entire rug in a wash pit, much like putting clothes in a washing machine. The rug actually goes through cleaning and rinsing cycles just like your clothes do when you wash them. 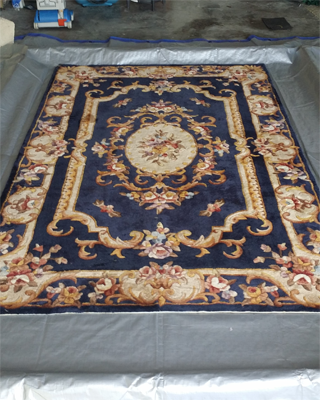 This type rug cleaning is most thorough cleaning you can perform on a heavily spoiled rug, or a rug that has been damaged with pet urine or other biological substances. It flushes out all the embedded soils as the cleaning and rinsing solutions pass through the rug. This particular rug was damaged by severe pet urine deposits. The rug was first beaten to dislodge the dry soils that were embedded deep in the fibers. The second step to remove harmful bacteria from the rug. It was sprayed with a sanitizing agent that killed all the bacteria and other micro organisms that were feeding on the urine crystals. Then the rug was submerged in the wash pit while the cleaning solution was run through it to dislodge the urine crystals and wash away the urea stains. After the rug was flushed out the cleaning solution was removed and the wash pit was filled with a solution to rinse the remaining cleaner from the rug. After cleaning and rinsing the rug was removed from the wash pit and extracted to start the drying process. After the majority of the moisture was removed from the rug it was flipped upside down and dried with powerful air removers. Not all rugs need to go through an immersion cleaning. Most can be cleaned regularly with a topical rug cleaning. Chem-Dry of Tampa FL can clean your rug no matter what condition its in.